The quarter seen next to the plate is for scale. The Hollenbeck Burrito is the creation of a singular master by the name of Manuel Rojas who owned the famed Manuel’s Original El Tepeyac Cafe in Boyle Heights. But the Hollenbeck is hardly the largest burrito he makes — or I should say made, since sad news came yesterday that Señor Rojas has died at the age of 79 after a half-century of serving them up. 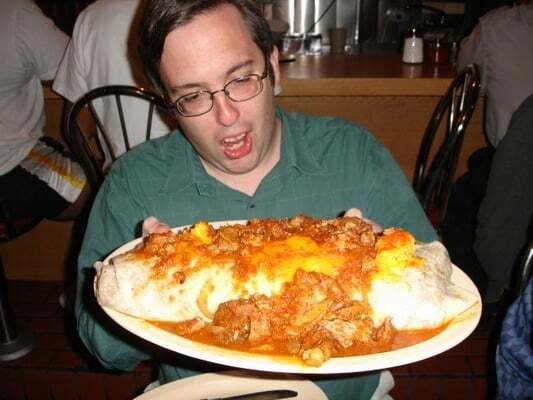 That distinction belongs to any variety of Manuel’s Special burritos, each of which roughly calculates out to being about 250 cubic inches of gut-busting deliciousness (here’s an example with the unknown patron exhibiting the appropriate level of shock and awe). Simply laying my eyes on such massiveness the one and only time I ordered a Manuel’s Special was almost enough to stave off my worst hunger pangs. Since then, it’s been Hollenbecks for me and they’re pleeeeeenty! But if the previously mentioned dimensional quantification is hard to wrap your head around, try this alternative: it weighs in at five pounds. I’m having trouble wrapping my head around Rojas no longer overseeing the construction of his classics, but I take solace that they live on, and I will most certainly be paying a visit in the near future to honor him by digging into one — and taking the inevitable leftovers home. I have fond memories of eating there with my parents as a child and seeing Manny’s smiling face. He’ll be missed!